New! Bridger #1 3/4 Coilspring Offset Square Jaw - An old favorite with many new upgrades is in stock and ready for immediate shipment. We brought this trap back after giving it a complete facelift. 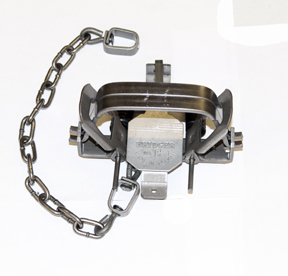 The Bridger #1 3/4 Coilspring Square Jaw comes stock with a Paws-I-Trip pan, heavy swivels, quality straight link machine chain, music wire springs, and an added baseplate with D-Ring. We settled on a size of 4 3/4" inside jaw spread and 5 1/8" outside jaw spread to keep it legal in virtually every state. Some trappers will want to outside laminate this trap with 3/16" rod and with these dimensions it will come in just under the magic 5 1/2" outside jaw spread that some states require. The measurements of this trap are nearly identical to the MB-550. 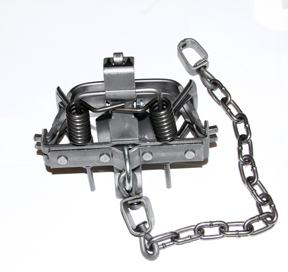 In field testing in several states this trap proved itself on fox, coyotes, bobcats, and raccoon. This is a tremendous trap for the mixed specie trapper.